Is Israel using Depleted Uranium (DU) against Palestinians? Where has DU been used? List of locations where DU Depleted Uranium was used People Exposed: Gulf War, Persian Gulf, Israel, Gaza, Yugoslavia, Japan, South Korea. IS THE ISRAELI MILITARY USING DEPLETED-URANIUM WEAPONS AGAINST THE PALESTINIANS? By John Catalinotto and Sara Flounders, Depleted Uranium Education Project of the International Action Center. 27 Nov 2000-- The International Action Center calls upon international organizations, NGOs, environmental and health organizations to investigate the Israeli military’s use of prohibited weapons in the West Bank and Gaza, and to mobilize to stop it. These weapons include dumdum bullets and CS gas. The IAC believes it also includes depleted- uranium weapons. The effect of dumdum bullets and CS gas is immediate, easily shown and obvious. Using radioactive and toxic depleted-uranium weapons is an additional crime that has an insidious long-term effect, not only on combatants and civilians in the vicinity, but over a broad area and to the general environment, as has been shown by the Pentagon’s massive use of DU weapons in Yugoslavia and especially in Iraq. The International Action Center’s own investigative team on Nov. 1 and 2 saw Israeli helicopter gun ships firing into densely populated areas. According to international law these attacks on civilian areas are war crimes--as is the long-term destruction of the environment from DU contamination. Mobilizing investigations, public challenges and mass protests against the use of DU weapons can stop this crime against humanity. The aim of this paper is to show with supporting data that it is credible that the Israeli military is using DU weapons in the Occupied Territories. We know that Israel is DU-armed and capable, and shielding on Israeli tanks is DU-reinforced. The IAC urges scientists, doctors and soldiers who know of the use of DU shells to come forward with definitive proof that the Israeli military has at least tested DU weapons in its attacks on Palestinian offices and homes. In addition, we urge environmental and other organizations to demand an accounting from these authorities. It will also show how following similar Pentagon or U.S. government denials regarding test-firing DU weapons in Puerto Rico, Okinawa Panama and south Korea, revelations and public pressure have forced admissions and in some cases have won pledges to stop firing DU weapons. In Kosovo, Yugoslavia, and in the Persian/Arabian Gulf region this pressure has led to international investigations and legal actions against DU use. U.S. arms make up the major part of the Israeli arsenal and Israel has been the number one recipient of U.S. arms aid for decades. These U.S. weapons include the M1 Abrams tank—which fires DU shells and is armored with DU-reinforced metal. The “Apache” and the Cobra helicopter gun ships are also equipped to fire DU shells. Since this latest Intifada started, the U.S. has shipped Israel “the newest and most advanced multi-mission attack helicopters in the U.S. inventory,” as reported in the Jerusalem Post. These were Apache helicopters. The IAC delegation witnessed Israeli attack helicopters, which people described to them as “Apache” helicopters from the U.S., firing shells and rockets at targets in and around Ramallah on Nov. 1. They then examined a small office used by the Fatah organization that the projectiles hit and destroyed. The following day they saw machine guns on tanks being fired at Palestinian youths in Ramallah armed only with rocks and slingshots. They also visited a Fatah office near Nablus that Israeli rockets had hit the night before. The IAC delegation gathered up shell casings and metal fragments in these areas. As they were preparing to leave from Ben Gurion Airport in Tel Aviv, members of the IAC delegation were stopped, searched and interrogated. The shell casings and metal fragments were confiscated. While this prevented the IAC from arranging its own tests, it made them even more suspicious that the Israeli forces were using DU shells and trying to hide it. Because of its great density, DU is also used to stabilize or balance airplanes and missiles, including the Tomahawk Cruise missile. When the missile explodes, or should the plane crash, the DU burns and is released into the air just as it is when DU shells hit steel. DU is also used to shield tanks, including the M1 Abrams tank used by the U.S. and Israel. After 32 continuous days, or 64 12-hour days, the amount of radiation a tank driver receives to his head from overhead armor will exceed the Nuclear Regulatory Commission's standard for public whole-body annual exposure to man-made sources of radiation. Whether from shells or from the scrapings from tanks moving around the countryside, radioactive materials enter into the land, the water and the whole food chain, contaminating the densely populated West Bank and Gaza, where water is a scarce resource. Wanton radioactive contamination of this region is a crime against all of humanity and a threat to the entire region now and for generations to come. According to the LAKA Foundation in the Netherlands, the Israeli army first used depleted-uranium weapons in the 1973 war, under direction from U.S. advisers. The same 1995 report from the U.S. Army Environmental Policy Institute mentioned earlier asserts that Israel is one of the countries with DU munitions in its arsenal. These included at that time at least Bahrain, Egypt, France, Greece, Kuwait, Pakistan Russia, Saudi Arabia, Taiwan, Thailand, Turkey, and the United Kingdom, as well as the United States. This assertion has been repeated in the Christian Science Monitor, the Jerusalem Post, the San Francisco Chronicle and other newspapers. Israel has a nuclear-weapons program more developed than that of any country except the five major nuclear powers. For exposing this nuclear program, Mordechai Vanunu, a nuclear-weapons technician, was kidnapped by the Mossad and held in solitary confinement 14 years. Given Israel’s own nuclear program and well-developed military industry, the likelihood is that Israel is a manufacturer of DU ammunition. The firm Rafael of Israel is named in numerous reports as being such a manufacturer. But even if this were not the case, Israel has been able to import DU weapons from the United States. DU, much like natural uranium from which it hardly differs, is both radioactive and toxic. DU is a waste product of the process that produces enriched uranium for use in atomic weapons and nuclear power plants. Over a billion pounds of DU exists in the United States and must be safely stored or disposed of by the Department of Energy. With its half-life of 4.5 billion years, the radioactivity of DU is effectively eternal. It is so abundant it has been given away to arms manufacturers. Because it is extremely dense—1.7 times as dense as lead--when turned into a metal DU can be used to make a shell that easily penetrates steel. In addition it is pyrophoric, that is, it burns when heated by friction from when it strikes steel. When DU burns, this spews tiny particles of poisonous and radioactive uranium oxide in the air. The small particles can be ingested or inhaled by humans for miles around, and even one particle, when lodged in a vital organ, can be dangerous. The Pentagon tested DU shells at various sites around the U.S., and used it openly in combat against Iraq during the 1991 Gulf war. At least 600,000 pounds of DU and uranium dust was left around Iraq, Kuwait and Saudi Arabia by U.S. and British forces during that war. DU is also considered at least a contributing cause to the 130,000 reported cases of "Gulf War Syndrome.” Numerous international studies in Britain, the United States and in Iraq have linked Gulf War Syndrome to the use of radioactive weapons in the bombing. The chronic symptoms of this ailment range from sharp increases in cancers to memory loss chronic pain, fatigue and birth defects in the veterans’ children. The damage to the Iraqi people was even more severe. A symposium in Baghdad in December 1998 found higher rates of childhood leukemia and other cancers in people living around Basra, Iraq, and attributed this to DU contamination. Data was presented on the pattern of a more than five-fold increase in many cancers, a ten-fold increase in uterine cancer and a sixteen fold increase in ovarian cancer and the high incidence of still births and congenital deformities, especially in Southern Iraq. The only admitted use of DU in combat has been in the 1991 war against Iraq, the 1995 NATO bombing of Bosnia and the massive NATO assault on Yugoslavia in 1999. There have, however, been other instances when the Pentagon has test-fired DU shells in such a way that it has endangered nearby civilians. Besides the many tests conducted within the United States, these include DU testing at sites in Vieques, Puerto Rico; Okinawa, Japan; Panama and South Korea. Vieques, an island near and part of Puerto Rico, has been a Pentagon target-practice site since 1940. For the past few years and especially since an errant U.S. bomb killed a Vieques resident in April 1999, people in Vieques and all Puerto Rico have mobilized to stop the testing on that island. As part of this mass mobilization, they have demanded that the U.S. Navy fulfill its responsibility to the local environment and clean up depleted-uranium shells it fired on the island. While first denying it did such testing, in January 2000, Navy spokespeople admitted firing 263 shells reinforced with DU during practice runs in Vieques, claiming they did so "by accident." They said Navy forces were able to recover 57 rounds, leaving 206. Removing the DU contamination has remained one of the demands of the movement in Vieques. Dr. Doug Rokke, former Director of the Pentagon's Depleted Uranium Project, has condemned the Navy’s use of DU in Vieques and called in a Feb. 9, 2000 news release for “complete environmental remediation of all affected terrain and medical care be provided for all affected residents of Vieques." The U.S. government never notified Japan it was testing DU weapons near Okinawa. Yet it turned out that a U.S Marine Corps AV-8B Harrier jet in late 1995 had test fired 1,520 rounds of DU ammunition. The Pentagon finally admitted this in an article published in the Washington Times on Feb. 10, 1997. This created such a national outrage including angry denunciations in the Japanese Duma that the U.S. government apologized, agreed to remove the weapons from bases on Okinawa and make an extensive clean-up of the site. As reported in the Japanese daily Mainichi Shimbun, Pentagon spokesperson Kenneth Bacon said the U.S. military has moved all depleted-uranium bullets deployed in Okinawa to south Korea. He also reportedly said that in south Korea, the shells are closer to a "potential battlefield. According to the Mainichi Shimbun article, a South Korean foreign ministry source said the U.S.-puppet government in Seoul had not been informed of the transfer. "If it is the case that the move was made to avoid further controversy in Japan, it could disturb sentiments of the [south Korean] people," the source reportedly said. According to an article in the Aug. 20, 1997 Christian Science Monitor, Rick Stauber, A member of the seven-person team that prepared the US Department of Defense's report on leftover ordnance at three military firing ranges in Panama, says during his investigation he was handed a report, listing all US weapon testing from the 1960s to the early 1990s, that showed that 120mm depleted- uranium projectiles were fired on Empire Range. At first, U.S. Ambassador William Hughs denied Stauber’s report. When the Fellowship of Reconciliation brought this to the attention of Panamanian daily newspapers, the strong reaction forced Washington to admit that the military had at least stored DU shells in Panama to test their deterioration in tropical climates. Stauber, a military consultant, said that they would then be obliged to test fire at least some of the shells to see if they were functional. Early in NATO’s war against Yugoslavia, on April 1, 1999, the International Action Center sent out a news release charging the U.S. with using DU weapons against Yugoslavia. While the Pentagon was trying to avoid comment on this, Pentagon spokespeople had already told the media that the A-10 Warthog anti-tank plane was being used against Yugoslav tanks in Kosovo. Finally pressure on this question from the media forced the Pentagon to acknowledge use of DU. Still, NATO headquarters and especially the Pentagon withheld cooperation with investigations of DU contamination of Kosovo. On Oct. 14, 1999, a United Nations official who chairs the task force investigating the impact on the environment of the 78-day U.S.- NATO bombing campaign against Yugoslavia said that NATO officials had refused to cooperate regarding their use of depleted- uranium weapons. Pekka Haavisto, task-force chairperson, said his team was unable to determine the extent of pollution caused by uranium-tipped weapons. He said NATO refused either to admit using the weapons or to cooperate with the task force. According to articles written October 2000 by Rainer Rupp in the Berlin daily, Junge Welt, and by British journalist Felicity Arbuthnot, concern over DU dangers have created problems involving both UN personnel and NATO-country troops occupying Kosovo. “Last week [Oct 14-20] the French government followed its Italian counterpart and launched an investigation of the effects of spent depleted uranium shells on its soldiers in Kosovo. Two Italian K-FOR (occupation) soldiers who were stricken with cancer and who showed symptoms similar to those with Gulf War Syndrome are to be flown from Kosovo to Rome in the near future. Notice that in all these cases the military authorities at first either stonewalled or denied that DU was being used, then wound up having to admit it. A flaming crash of an El Al cargo jet in Bijlmer, a suburb of Amsterdam on Oct. 4, 1992, killing 43 people has been the target of ongoing research. The health consequences for people in a whole section of Amsterdam has created an ongoing movement of the Dutch Greens on the chemical and radiological toxicity of depleted uranium. The El Al Boeing 747 jet had on board tons of chemicals, flammable liquids, substances used in the manufacture of nerve gas and 1,500 kilograms of DU in the form of counterweights. Both the nerve gas chemicals and the DU have long been a topic of debate. The Dutch Ministry of Defense report “Health risks during exposure to uranium” documented the radiotoxic effects of DU in the human body. U.S. veterans organizations have campaigned to demand investigation and compensation for their extremely high incidence of chronic sicknesses among Gulf War veterans. The U.S. government has denied their claims. IS ISRAEL USING DU IN COMBAT? Some may argue that because the Israelis are not firing against tanks—the strongest military justification for using DU shells—but against unarmed or at the most lightly armed and virtually unprotected opponents, there is no special reason for them to be using DU shells. This is true. But the same could be said for U.S. forces in Vieques, Panama, Okinawa and south Korea, yet DU weapons were tested in all those places. Like the Pentagon brass, the Israeli general staff would want to try out their weapons under all conditions, especially in combat. Now that they are firing at homes and offices in an attempt to punish the Fatah leadership, they would want to see if DU shells penetrate concrete as they do steel and if this makes a difference in battle. The Israeli military has already shown its racist contempt for the Palestinians by firing to maim thousands and kill hundreds of young people protesting the occupation of their country, people armed in the great majority with stones and slingshots. As of Nov. 20, over 240 people have been killed and over 8,000 wounded. And the Israeli officers have a strong reason to use DU-shielded tanks. They want the Israeli soldiers and their families to think that they are invulnerable in their tanks and armored personal carriers shielded with DU armor. If the troops grow ill months or years later from their constant exposure to radiation, that is no longer a political problem for the generals. The same is true when they handle shells and fire rounds from tank guns. The Israeli peace movement and the families of the troops, should know that the illusion of invincibility comes at a price. There has already been the beginning of resistance among individual Israeli troops to playing the role of oppressor. This movement should seriously consider the dangers of DU. The first step to exposing and stopping this crime and its long-term impact is to start a serious investigation of Israeli use of depleted- uranium weapons. Sara Flounders and John Catalinotto are editors and contributors to the book “Metal of Dishonor: Depleted Uranium” and organizers of the Depleted Uranium Education Project based at the International Action Center in New York City. Flounders returned Nov. 3, 2000, from a five-day fact-finding trip to the West Bank and Gaza. The DU Education Project of the IAC is not a scientific research organization. But it has based its published material on the work of many prominent scientists and anti-nuclear organizations to create an awareness of the Pentagon’s reckless disregard for all human life and for the future even in their limited and conventional wars against small and developing nations. br> The International Action Center is an organization committed to building resistance to U.S. militarism, war and racism. The IAC attempts to link together through information and concrete solidarity many different struggles. Information on the campaign against the U.S. use of DU weapons is available on the IAC web site: www.iacenter.org/depleted/du.htm “Metal of Dishonor: Depleted Uranium" is available from the IAC or may be ordered on line from: www.leftbooks.com . To contact the IAC on this question, call 212-633-6646 or email them at iacenter@iacenter.org . Nov. 12, 2000 - A major anti-war organization in the United States is calling for an international investigation of Israeli use of depleted uranium shells in its attempt to repress the Al- Aqsa Intifada--the uprising of Palestinians against the occupation. The IAC is calling upon "international organizations, NGOs, environmental and health organizations to investigate the Israeli military's use of prohibited weapons in the West Bank and Gaza, and to mobilize to stop it. These weapons include dumdum bullets, CS gas and depleted uranium weapons." Sara Flounders, Co-Director of the IAC was in occupied Palestine from Oct. 28-Nov. 2, 2000, as part of a four-person IAC delegation. The delegation was on a fact-finding mission and also delivered medical supplies to Palestinian clinics and hospitals in the territories. "Such use of DU weapons," says Flounders, "adds to the crimes the Israeli forces are committing against the Palestinian population. Israeli helicopter gun ships are firing into densely populated areas. According to international law these attacks on civilian areas are war crimes, as is the long-term destruction of the environment from depleted uranium contamination. "The radioactive materials enter into the land, the water and the whole food chain, contaminating the densely- populated West Bank and Gaza, where water is a scarce resource. The wanton radioactive contamination of this region is a crime against all of humanity and a threat to the entire region now and for generations to come. "We urge scientists, doctors and soldiers who have handled these weapons to come forward with information. Information supplied this way in Puerto Rico, Okinawa and south Korea recently have helped mobilize against DU use and put the Pentagon on the defensive. This crime and its long-term impact must be fully exposed and stopped." The draft of a paper on DU the IAC intends to release Nov. 16 shows that in Vieques, Puerto Rico, and in Okinawa, Panama and south Korea, the Pentagon had either kept secret or denied using DU until popular organizations challenged the U.S. military. Following the protests, the Pentagon was forced to admit DU use. In Okinawa the U.S. apologized and promised not only to no longer use DU but also to begin to clean up spent DU shells. In addition, movements in France, Italy and other NATO countries occupying Kosovo have sparked official investigations of the dangers their troops face from exposure to DU from shells fired by U.S. planes during the 1999 war. There are reports that the Portuguese government will withdraw its troops because of DU dangers. Flounders told how the IAC delegation witnessed "Israeli attack helicopters, which people described to us as 'Apache' helicopters from the U.S., firing shells and rockets at targets in and around Ramallah. We then examined a small office used by the Fatah organization that the projectiles hit and destroyed." "We also saw Israeli tanks and other armored vehicles firing machine-gun rounds and larger projectiles at youthful demonstrators in Ramallah," Flounders added. "We collected some of the shell casings and metal fragments from the different target areas to bring back to the United States for evaluation and testing." Flounders said: "As we were preparing to leave from Ben Gurion Airport in Tel Aviv, members of our delegation were stopped, searched and interrogated. The shell casings and metal fragments were confiscated. While this prevented us from doing our own tests, it made us even more suspicious that the Israeli forces were using DU shells." A 1995 report from the U.S. Army Environmental Policy Institute asserts that Israel is one of the countries with DU munitions in its arsenal. Given Israel's own nuclear program and well-developed military industry, the IAC believes Israel is quite likely a manufacturer of its own DU ammunition. The "Apache" and the Cobra helicopters--both used by the Israeli armed forces--are equipped to fire DU shells. Also, the Israeli Sabra tank is modeled on the Abrams M1A1 tank, which is also capable of firing DU shells. DU is a waste product of the process that produces enriched uranium for use in atomic weapons and nuclear power plants. Because it is extremely dense, when turned into a metal DU can be used to make a shell that penetrates steel. It's also pyrophoric; that is, it burns when heated by friction when it strikes steel. When DU burns, it spews tiny particles of poisonous and radioactive uranium oxide into the air. The small particles can be ingested or inhaled by humans for miles around. Even one particle, when lodged in a vital organ, can be dangerous. At least 600,000 pounds of DU and uranium dust was left around Iraq, Kuwait and Saudi Arabia by U.S. and British forces during the 1991 war against Iraq. A symposium in Baghdad in December 1998 found higher rates of childhood leukemia and other cancers in people living around Basra, and attributed this to DU contamination. For some cancers the rates were 5 to 10 times higher than normal. DU is also considered at least a contributing cause to the 120,000 reported cases of "Gulf War Syndrome." Numerous international studies in Britain, the United States and Iraq have linked Gulf War Syndrome to the use of radioactive weapons in the bombing. The chronic symptoms of this ailment range from sharp increases in cancers to memory loss, chronic pain, fatigue and birth defects in the veterans' children. While the Pentagon continues to deny any great dangers from DU, the 1995 U.S. Army Environmental Policy Institute study, entitled "Health and Environmental Consequences of Depleted Uranium in the U.S. Army," stated: "If DU enters the body, it has the potential to generate significant medical consequences. The risks associated with DU in the body are both chemical and radiological.... Personnel inside or near vehicles struck by DU penetrators could receive significant internal exposures." DU is also used to make tank armor and is used in heavily armored Israeli vehicles. Exposure to radiation for those remaining in the tanks for a long time or from handling wea pons can be another source of danger. "Like the U.S. generals who are the main supplier of Israeli weapons," said Flounders, "the Israeli general staff are indifferent to protecting the long-term health of their own rank-and-file soldiers, not to speak of their racist contempt for the Palestinians. "For groups inside Israel who oppose the repression of Palestinians, challenging DU use could increase the conscientious resistance from individual Israeli troops that has already surfaced." For more information on the campaign against DU weapons, visit the IAC Web site at www.iacenter.org/depleted/du.htm. 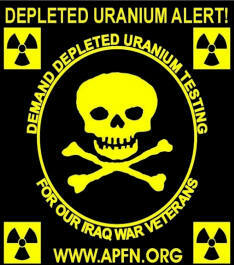 Depleted Uranium: Locations used, listing of places, areas and wars where Depleted Uranium or DU was used.